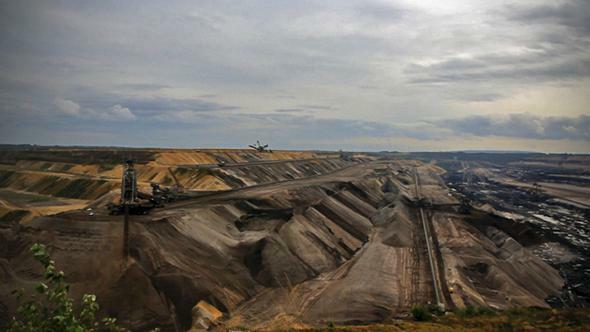 Coal mines swallow towns in Germany: Why solar and wind haven’t kicked the coal habit. If Germany can’t kick its coal habit, can anyone? The Garzweiler mine is named for the first German town cleared away to make room for it. Holzweiler, Germany, just escaped impending death. The tidy village of stone houses clustered around an aging cathedral is only 40 minutes up the autobahn from the modernist bustle of Cologne, the country’s fourth-largest city. The drive winds past farms spiked with towering wind turbines, standard-bearers of Germany’s nationwide green energy overhaul. But Holzweiler’s quiet sidewalks are also precariously close to one of Europe’s largest open-pit coal mines. When I visited last fall, residents of Holzweiler and a cluster of neighboring villages were living on borrowed time. The villages were in the way of the expanding mine, and locals had been told by the government that within a matter of years their homes would be bulldozed to get at the coal—the world’s dirtiest kind, known as lignite—buried underneath. 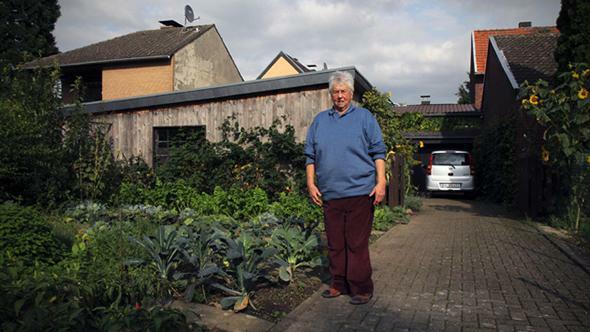 Gisela Irving, a 78-year-old Holzweiler resident, keeps a small garden and a few chickens here that she raises with the help of a big, shaggy mutt named Butch. Gisela told me the region’s threatened destruction was hard to reconcile with its bucolic present. Gisela Irving lives in Holzweiler, which was just spared from being swallowed by the mine. “It’s a peaceful world,” Gisela said, stooping to pluck a green pepper. Paradise peters out just a few blocks from this yard, where the cobblestone street turns to mud and the houses—many already vacated—yield to prairie. Since the early 1980s, Gisela has watched the coal mine—called Garzweiler after the first town cleared away to make room for it—inch closer to her door. In her yard, we could hear the low, not-so-distant churning of massive digging machines. Gisela and her neighbors had spent years pleading with the regional government to block the machines’ steady march; yellow ribbons adorned the gates of many houses here, signs of solidarity against the encroaching mine. In December, Germany’s top court ruled that Garzweiler was important enough to the national power system for the company operating it, RWE, to proceed with plans to pay for the demolition and relocation of these towns. Last month, the government decided to spare Holzweiler, but nearby towns have not been so lucky. It’s a familiar battle for many Germans: Since World War II, open-pit lignite mines have displaced roughly 35,000 people, according to RWE. The same drama playing out here is also unfolding in the country’s other main coal region, south of Berlin. Germany’s struggle with lignite mining is taking place behind the scenes of its green energy revolution, known here as the Energiewende. If Germany—which bills itself as one of the planet’s most climate-friendly nations—can’t kick its coal habit, can anyone? Outside Holzweiler is a grassy hilltop where one can see a row of massive smokestacks—power stations fired by the local coal—nestled among a dozen wind turbines. It’s a strange contrast: Over the past decade, Germany has become a world leader in creating electricity from renewable sources, like the sun and the wind, that don’t spew climate-warming greenhouse gases. The government has committed to some of the world’s most aggressive climate goals: By 2050, it wants to slash its greenhouse emissions by between 80 and 95 percent compared with 1990 levels while getting at least 80 percent of its power from renewable sources. Renewables already provide nearly a quarter of the country’s electricity, double the U.S. rate and among the highest in Europe. Energy policymakers in the United States are keeping a close eye on Germany, because curbing coal use is a central tenet of President Obama’s climate action plan. This year the U.S. Environmental Protection Agency is pushing a pair of proposed regulations to limit carbon emissions from new and existing coal plants. Obama’s coal strategy is more head-on than the German model, which looks more like death by a thousand solar panels, and which is proving to be a very slow death indeed. Despite its progress with renewable energy, Germany is still dependent on coal for nearly half its power—a larger proportion than even the United States is. And there’s little hope for that to drop anytime soon. In 2013, coal’s share of the country’s energy mix rose 1.5 percent over the previous year, nearly three times the growth in renewables. 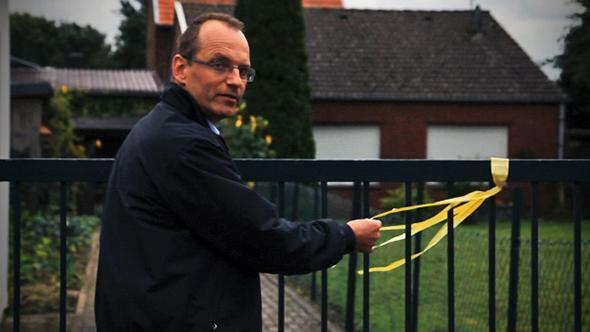 At the edge of Garzweiler, a yellow ribbon is “a sign of solidarity for the people who are going to lose their houses,” says Dirk Jansen, a local anti-coal campaigner. The Garzweiler mine will keep operating into the 2040s, according to RWE. At 35 million metric tons each year, it unearths about a third as much coal as the United States’ top-producing mine. But the scale here is still overwhelming: It covers 18.5 square miles—that’s half the area of Manhattan. Stand on one side and the pit stretches all the way to the horizon. An excavator wheel as tall as a seven-story house continuously shovels out coal, which is loaded onto a 57-mile network of conveyor belts to be delivered to the nearby power plants. And this is no ordinary coal. Most U.S. mines produce bituminous coal, which forms deep underground at high pressure, has a relatively high energy content, and resembles a hard, black rock. Most coal produced in Germany, on the other hand, is lignite, which forms close to the surface (hence the open-pit, rather than deep-shaft, mine) and is brownish, moist, and crumbly. Its energy content is substantially lower, meaning much more must be burned to produce the same amount of electricity. Lignite also produces 6 percent more carbon emissions per unit of energy than bituminous coal, and 80 percent more than natural gas. Add that up, and the impact is startling: Just one lignite-fired power plant produces up to 50 million metrics tons of CO2 each year, according to the European Climate Foundation. That’s about as much as the state of Montana. But more importantly it’s fully half the level of carbon emissions Germany aims to produce in total by midcentury. That’s why experts say that if Germany wants to meet its ambitious climate goals, phasing out coal will be the biggest challenge. At the end of March, Holzweiler finally got some good news. 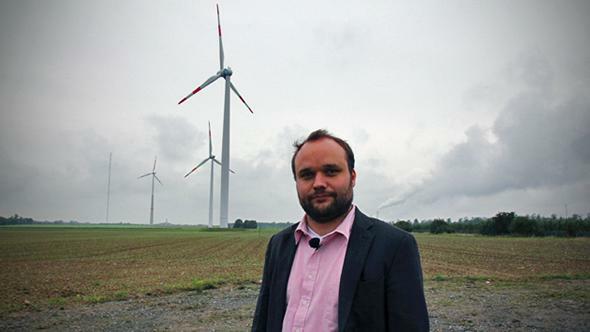 In a compromise between the coal industry–aligned Social Democratic Party and the climate-focused Green Party, the state government decided to limit Garzweiler’s growth—a rare move for this historic seat of coal production. Holzweiler, which was first settled in Roman times, will be skirted by the mine and spared from destruction. An estimated 1,300 people won’t have to relocate, and about a fifth of the mine’s coal will stay buried. But about 2,000 people in neighboring villages still face relocation, at RWE’s expense, so that the company can access roughly a billion metric tons of coal. RWE, for its part, tries to ensure that “the personal impact to these people is as low as possible,” according to Thomas Birr, a senior strategist with the company. “I acknowledge the personal and emotional challenge of those people we have to relocate, and we take that into account, of course,” he adds. 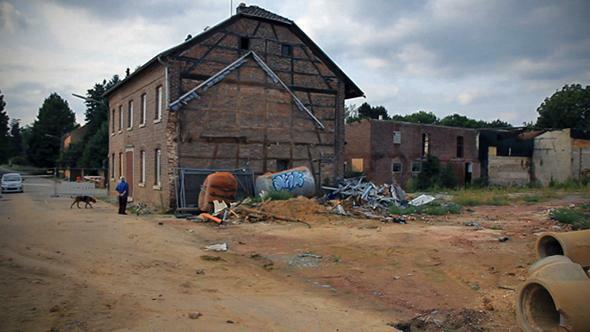 With many of its residents moved out, the nearby village of Immerath is already a ghost town. Gisela drove me to a street that dead-ends into the mine, a place she calls “the edge of the world.” The brick houses were shuttered and crumbling, the edge of the village literally eroding away. Germany’s image as a world leader in renewable energy is the product of the Energiewende (loosely translated as “energy transition”), a term used to describe a combination of specific energy policies and a culturewide attitude shift that has its roots in the Chernobyl nuclear power plant explosion in 1986. That disaster lit the spark of overwhelming anti-nuclear sentiment in Germany that persists today, codified in a 2002 law that calls for the shutdown of all the country’s nuclear plants by 2025. But the explosive growth in renewable energy here—from 7 percent of the national mix in 2000 to more than 23 percent in 2013—comes as a result of the Renewable Energy Act of 2000. The law sets an ambitious goal to boost renewables and provides a unique financial prod to make that happen. Support comes in the form of a “feed-in tariff,” an incentivizing carrot for clean-energy production that compels utility companies to purchase any available renewable energy at a higher wholesale price than they would pay for power from fossil fuels. That’s true regardless of whether it’s coming from a large corporate offshore wind farm or from solar panels on your roof. The price varies by the exact source to reflect the varied costs of different technologies and is locked in for years into the future, to give the market stability. But each year, the offered price goes down a little bit, so early birds benefit the most. Because the rates are guaranteed by law into the future, investors in renewable energy get a kind of long-term security not possible in a system that has to be reapproved by legislators every year, like the United States’ Production Tax Credit for wind power, which, sure enough, Congress allowed to die at the end of 2013. Of course, someone has to pony up for all this: The money comes from a surcharge on German ratepayers’ electric bills, roughly 10 percent of an average household’s monthly total. In 2013, those fees added up to a $2.5 billion subsidy for renewable energy, according to Deutsche Bank. Spend an afternoon on a train through the German countryside and it’s easy to see how that investment has paid off: Houses and office buildings are slathered with solar panels, and wind turbines line the horizon most ways you look. That’s what makes Garzweiler, and its attendant cadre of smoking power stations, so jarring. So why hasn’t Germany’s renewables boom been matched by a drop in coal use? The problem actually starts outside Germany, in the continentwide Emissions Trading Scheme. 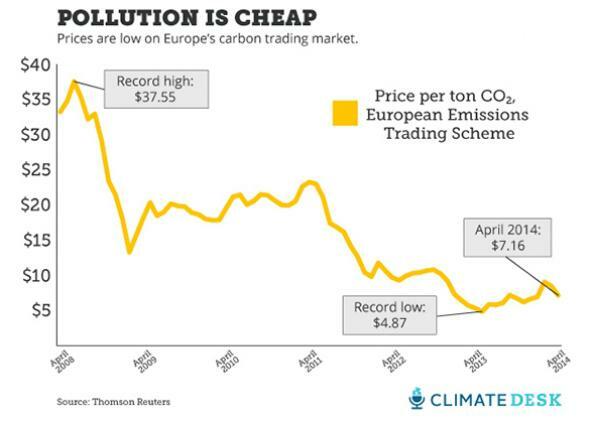 This is a cap-and-trade market in which EU regulators set an overall limit on how much carbon dioxide can be released by large polluters (the cap), and then companies buy and sell credits for their emissions (the trade). Established in 2005, the ETS is the world’s largest carbon marketplace, covering 11,000 plants and power stations across 31 countries that together produce 45 percent of the European Union’s greenhouse gas emissions. The idea is to push electricity-generation companies off fossil fuels by making it expensive to emit carbon dioxide. Over time, the cap shrinks, which drives up carbon prices, which in turn increases the pressure to clean up. Energy analyst Lutz Weischer says Germany will need to use far less coal if it is going to meet its climate goals. Of course, that only works if the price of a carbon credit (called an “allowance”) is sufficiently high to be a real burden, and for the last few years that has been far from the case. In 2013, prices were the cheapest they’ve ever been, after declining more or less steadily since the start of the financial crisis. The low point was last May, when a ton of carbon pollution cost only $4.87, down 87 percent from a high of $37.55 in summer 2008. In other words, while normal folks took advantage of the feed-in tariff to build renewable power, the country’s large utility companies had little incentive to move off of coal. For that to happen, the ETS “must be rescued and repaired and reformed,” according to Felix Matthes, one of the country’s leading experts on the Energiewende at the Berlin-based Öko-Institut, a nonprofit think tank. The main reason for the carbon market’s decline, Matthes says, is that because of the recession, Europe’s economic development has been about 20 percent slower than was expected when the allowance cap was set in 2008, meaning credits were sloshing around without being used. The market also allows the trading of allowances from foreign carbon markets, primarily China; together, the too-high cap and the market’s permeability resulted in an oversupply of allowances, and the price crashed. As a result, a key tool to motivate a transition away from coal was lost, with little German policymakers could do by themselves to fix it. There’s a lesson here for U.S. policymakers, according to MIT’s Knittel. The German experience, he says, is proof that pumping cash into green tech is only effective if, at the same time, the biggest carbon polluters are forced to pay for their emissions. That could take the form of a carbon tax, widely viewed as a nonstarter in Congress, or carbon-cutting regulations like those currently being pushed by Obama and the EPA, which would force coal companies to invest heavily in carbon capturing systems if they want to keep their plants open. “Economists are pretty unanimous in that the way you should incentivize more solar panels, for example, is by making the dirty electricity more expensive but not subsidizing the clean electricity,” he says. And good luck convincing the American public that renewable energy subsidies should come out of their monthly electric bills, like they do in Germany. “So I actually think what we want to learn from Germany is to not adopt these sorts of policies,” Knittel says. Since I visited Germany last fall, there’s been some progress in the cap-and-trade market. In February, EU carbon prices rebounded to just over $9 per metric ton following a January vote by the market’s framers to withhold 900 million allowances until 2019 and are expected to rise a little more by the end of the year (although by mid-April they were back down around $7). There’s another sign of change on the horizon: Germany’s solar explosion drove the supply of electricity on the grid so high that nonrenewable wholesale prices—the amount utility operators pay to purchase electricity from a power plant—have dropped to the floor. That makes it much more difficult for power companies to recoup the billions of euros they’ve invested in building the plants, which in turn makes any investments in new coal plants seem unattractive. That’s bad news for the companies that have long been the backbone of the energy system; if the plants become economically unviable, these companies’ entire business model could collapse, taking the coal industry with them. One person working on this problem is Birr at RWE, the second largest of Germany’s four major utility companies and the owner of the Garzweiler lignite mine and its adjacent power plants. I met Birr in the company’s glass-encased corporate boardroom at the top of a gleaming tower in downtown Essen, an enclave north of Cologne that is a historical center of the steel and mining industries. In the past decade, Birr says, the price at which the company sells electricity has dropped by half, from 80 euros ($109) per megawatt-hour in 2000 to less than 40 euros ($54) today. But with no effective price on carbon, there’s no reason not run the existing plants for all they’re worth. In other words, today, the cost of carbon pollution is low enough to justify operating the old plants. But because the wholesale electricity price is still low, companies like RWE are squeamish about future investments in new plants they insist are still necessary. Birr argues that because of the inherent variability of renewables (Germans still need electricity when the sun isn’t shining and the wind isn’t blowing), coal will still be “desperately needed” in the energy mix for decades to come. Many energy watchdogs here think Birr and his peers are missing the point. For one thing, it can take nearly a day to fire up a switched-off coal plant, making it an imperfect candidate to pick up the slack for a sudden, temporary drop in wind or solar. (Natural gas plants can come online much quicker.) But more to the point, there is money being left on the table. The Öko-Institut estimates that Germany’s four major utility companies, the old guard of fossil fuel energy, account for only 10 percent of the country’s total investment in renewables. RWE, for one, says it has put about $11 billion into renewables since 2008, out of $75 billion in revenue from 2013 alone. RWE’s investment, like that of the other big players, comes primarily in the form of big offshore wind turbines in the North Sea that are too expensive for individuals or small companies to build. Meanwhile, households and small-to-midsize renewable power companies make up the rest of the investment pie. In other words, companies like RWE could be missing a golden chance to get in on the ground floor: Recall that the renewable energy subsidy declines over time, meaning the longer one waits, the less one benefits. The village of Immerath, on the edge of Garzweiler, is already eroding away. At the edge of Garzweiler, that vision of the future still seems far off. Gisela put Butch on a leash and walked through the empty streets of Immerath, the neighboring village that has already been abandoned in the face of the encroaching mine. It was silent, and bits of trash drifted past on the breeze like tumbleweeds. We walked up the steps of a towering, ancient cathedral where Gisela used to come for concerts and a farmer’s market. Now the doors were locked. This story was produced with the support of the Heinrich Böll Foundation.